Simon & Schuster, 9781451699371, 304pp. 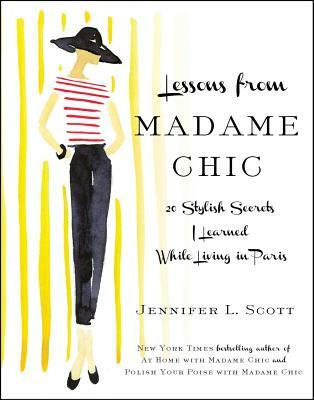 Jennifer L. Scott is the New York Times bestselling author of Lessons from Madame Chic, At Home with Madame Chic, and Polish Your Poise with Madame Chic and the writer and editor of The Daily Connoisseur (DailyConnoisseur.com). She lives in Southern California with her family. Visit JenniferLScott.com. "A guide for women who yearn to channel Audrey Tautou. . . . Personable, anecdote-filled, and studded with lifestyle tips . . . its vivacity and sincerity have struck a chord among women who would like a French role model of their own, but don't have a year to spend apprenticing with one in Paris." "Part tribute to the effortlessly glamorous Parisian way of life, and part tutorial . . . on how to emulate the French je ne sais quoi." "The writing here, a combination of elegance and breeziness, seems to reflect Madame Chic’s personal philosophy that life is to be lived fully and elegantly." "Scott's book encourages American women to live simply and beautifully by eating well, slowing down, simplifying their lives and enjoying life." "Scott blends vignettes and fun encounters with philosophies and lessons that helped her evolve a sense of style and aesthetics. Lessons from Madame Chic is a fine pick for anyone interested in women's fashion, style, and how the French have recreated style lessons."